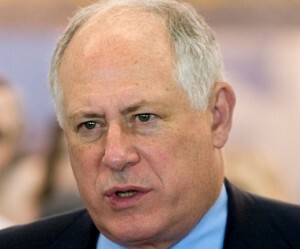 CHICAGO — The governor of Illinois signed a bill into law on Wednesday that allows homosexuals to ‘wed’ in the state. Democratic Governor Pat Quinn held a signing ceremony at the University of Illinois in Chicago, which was attended by an estimated 2,000-3,000 supporters, including former White House Chief of Staff Rahm Emanuel, who now serves as mayor of the city. Using a hundred pens to sign the Religious Freedom and Marriage Fairness Act into law, Quinn sat down at a desk that had been shipped in from Springfield, which had been used by President Abraham Lincoln in 1861 to write his first inaugural address. As previously reported, a number of lawmakers spoke out against the legislation earlier this month as the bill was being debated in the House, stating that it was a violation of Scripture. The legislation ultimately passed 61 to 54, and moved on to the Senate, where it was approved 31 to 21. Laurie Higgins of the Illinois Family Institute wrote in an article yesterday that the legalization of homosexual “marriage” may open the door to all types of other marital arrangements. The bill is set to take effect on June 1, 2014. NBC Chicago reports that the Illinois Office of Tourism has already begun promoting “gay-friendly” tourism spots in the state.